PLEASE REFERENCE THE TABS AT THE TOP OF THE REGISTRATION PAGES FOR INFORMATION REGARDING AGENDA, FEES, HOTEL RESERVATION INFORMATION AND MORE DETAILS ABOUT THE CONFERENCE. 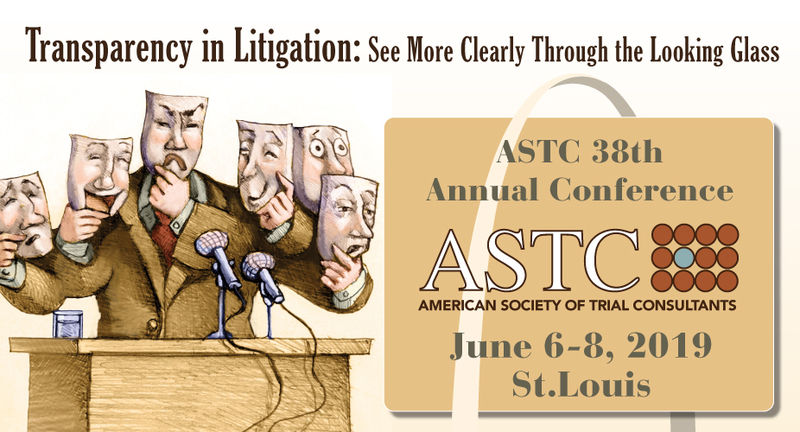 St. Louis, Missouri and ASTC continues to provide educational and social opportunities for its members and all conference attendees! We look forward to your participation this year! Please note on the registration page there is a Fee for members wishing to attend and advanced sign-up required. TC 101 is a must attend program for students and those new to trial consulting. This program will be taught by Lisa DeCaro. Please note on the registration page there is a Workshop Fee and advanced sign-up required. Are you a new member or student (“interviewee”) looking to make connections with experienced trial consultants? Or perhaps, you are an experienced member (“interviewer”) looking for potential talent? The speed meet is the perfect opportunity to get plugged in to the profession. Advanced Sign-up is required. No fee. Be sure to indicate whether you are an interviewee or an interviewer. The day finishes with the Opening Reception and Dine Arounds. Come to the exhibitor space to gather with old friends over drinks and meet our exhibitors. Dinner will be dine-arounds with a focus on embracing students and new members. Advanced sign-up for dine arounds at area restaurants are necessary.